Week-long music camps for the Curious, Emerging and Advanced musician. Ages 8-12. All levels are welcome! Packed, fun, social days of tailored music instruction, where visiting symphonic artists immerse campers with all instruments of the orchestra. Daily workshops in singing, choir, composition, music theory, notation and sight reading. World history is discovered through the music of classical, pop, jazz and world sounds. Campers are paired according to their level, and our small 20 attendance limit is further divided by camper level: Instructor, camper ratio is 1:7. Advanced musicians receive tailored instruction (masterclasses) in musicianship and performance from visiting professional symphonic artists. Younger and non-musicians can also discover which instrument inspires them before the next school year: Strings, Brass, Percussion, Keyboard, Woodwinds! 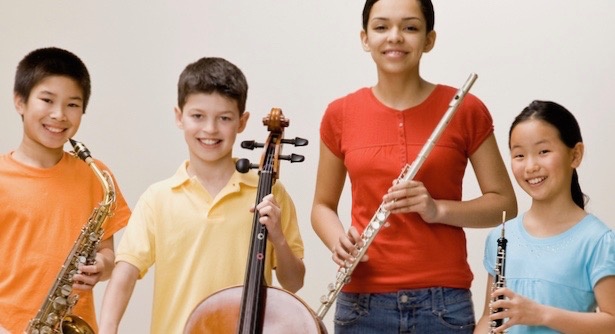 Experienced players will be able to return to private lessons at an improved level of sight-reading and musicianship. All camps are held from 9:00 am to 3:00 pm Monday through Friday. Age range is 8-12 years. Early drop-off is available for $25/week. The cost per session is $280. Siblings receive a $20 discount for a total cost of $260 per additional child. Each session is limited to 20 campers, with a 7:1 adult to camper ratio. Completion of this form and payment are required to enroll your camper. All refunds are subject to a 10% processing fee. Cancellations received and acknowledged by Southern California Piano Academy 3 weeks prior to the first day of class will receive a 75% refund. Cancellations received 2 weeks prior to the first day of camp will receive a 50% refund. No other refunds are given with less than 2 weeks notice of cancellation. Siblings receive a $20 discount for a total cost of $260 per additional child. Please contact the school director prior to registration to inquire about merit and need-based scholarships. We reserve a small amount spots per session. Learning Style: Specify anything which would help us better accommodate your child's learning style or personality. Is there anything else you'd like to share with us about your camper? I, the undersigned, as parent or legal guardian of the child listed on this form, hereby authorize Southern California Piano Academy and its delegated leaders and directors to consent to any medical and hospital care to be rendered to said minor upon the advice of a licensed physician. It is understood that if time and circumstances reasonably permit, Southern California Piano Academy will endeavor, but are not required, to communicate with me prior to such treatment. The undersigned further agrees that Southern California Piano Academy and its designated leaders and directors are not legally or financially liable for any claim arising from any consent given in good faith in connection with such diagnosis or advised treatment. This authorization and consent to treatment of the minor is given to Southern California Piano Academy in conjunction with the Summer Camp program 2019. I hereby consent to the use of photographs or video of my child/dependent and any copies of this photograph or video in any editorial and promotional material produced and published by Southern California Piano Academy. I understand that signing this release does not guarantee publication of photos. It is important to Southern California Piano Academy that all campers have a positive and rewarding experience while at camp. In order to ensure the safety and fun for all campers, participants are expected to behave in an acceptable manner and use appropriate language. ANY behavior deemed to be detrimental to or in violation of the camp’s expectations will be dealt with by the camp staff and/or Director. Unacceptable behavior may include, but not limited to any form of intended harm to another camper or staff member, bullying or any form of aggression towards people or property. Any situation that involves distracting other participants or disrupting camp activities (including cell phone usage/game playing) will not be tolerated. It is important to remember that there are NO REFUNDS if a child is asked to leave Southern California Piano Academy due to unacceptable behavior. By paying your registration fee in full, you signify that you understand and agree to the Acceptable Behavior Policy. I have read and will abide by the Southern California Piano Academy rules. I understand that Southern California Piano Academy staff have the right to remove any person from the program that does not abide by these rules. If I am asked to leave, I understand that my payment is not refundable.